Okay, and maybe some real snow too, but since I can’t control the weather, I’m making snowflakes! It’s weird, by this time of year we always have snow on the ground, and not just a thin layer, but lots of it. I can’t remember a year when we haven’t had piles of snow all over the place by now, so the fact that we have so little snow is weird…and kind of sad. Snow in December is my absolute favorite. Snow in March…April…May? No thanks, but snow in December, yes please. 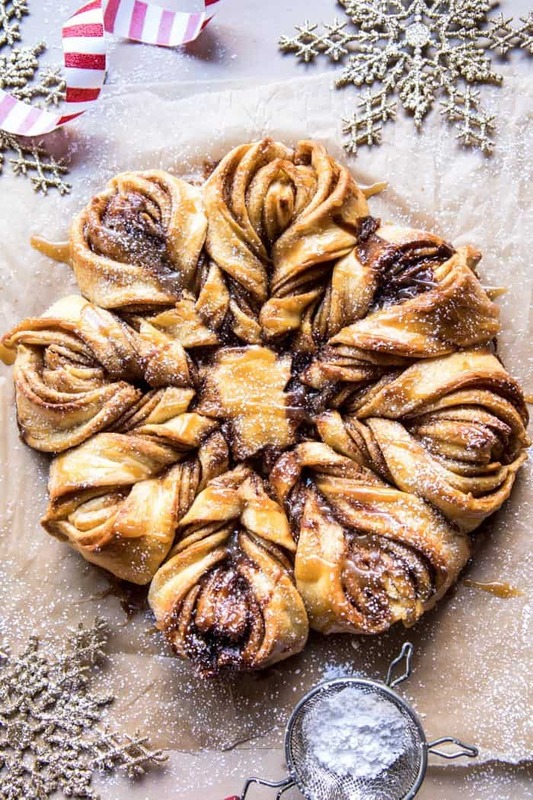 Obviously, there’s not much I can do about the lack of white stuff here in the west, but what I can do…is make deliciously gooey and sweet monkey bread that looks like a giant snowflake. Yup, that I can do. 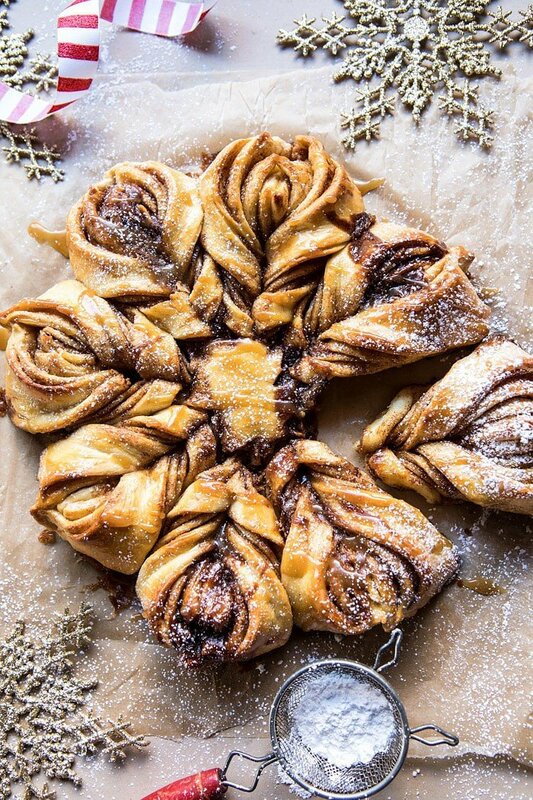 For real though, how cute is this snowflake monkey bread? 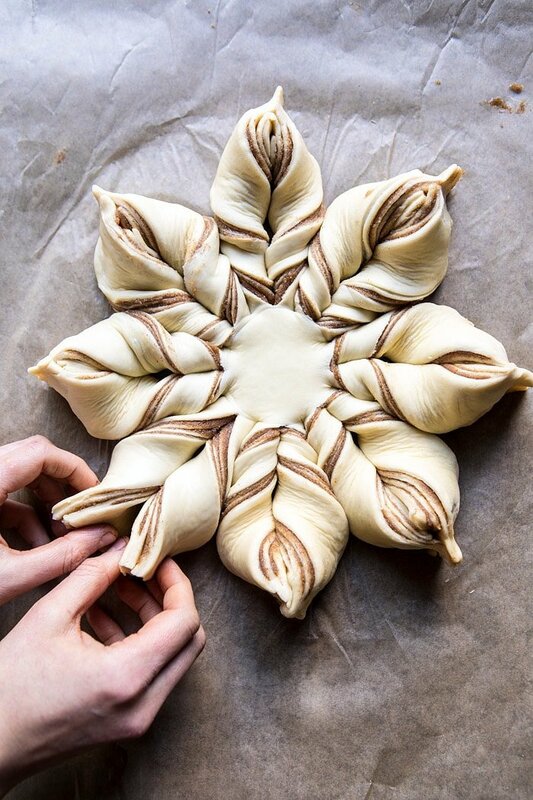 I’ve seen these snowflake breads all over my Pinterest page for years now and always thought they were the cutest. It wasn’t until this year that I had the idea to recreate my mom’s butterscotch monkey bread recipe into this festive snowflake. But I’m so glad the idea came to mind, because not only is this bread cute, it’s also incredibly delicious. 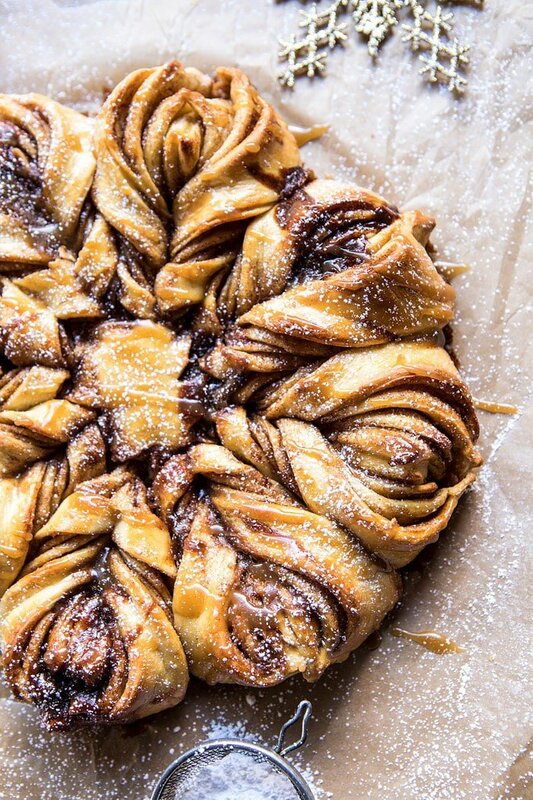 Warm, doughy, gooey, extra sweet, and loaded with cinnamon and butterscotch. It’s basically the ultimate Christmas morning breakfast. Now, I know what you guys are thinking, this looks so hard to make. Trust me though, this is not hard to make. I know it looks fancy, but in all honesty, it’s kind of easier than making monkey bread. I mean, it’s not as easy as my mom’s monkey bread, because her recipe doesn’t use homemade dough, or homemade butterscotch sauce and filling, but the process of actually making the snowflake is pretty easy…and fun! Or at least I did anyway. Hey, I am not a professional pastry baker. I can bake, but making things look extra pretty? Not necessarily my thing. Point is, even if you think you can’t make this, you can! I tried to snap a bunch of photos of the twisting process so that you can use those as a guide when making your own bread. I am such a visual person, so at least for me, photos always help. It’s really just a matter of layering the dough and then twisting. Pretty simple. And even if your snowflake doesn’t end up looking very “snowflake…ish”, don’t worry. All that matters is how the bread tastes, and it’s going to taste great in whatever shape or form. 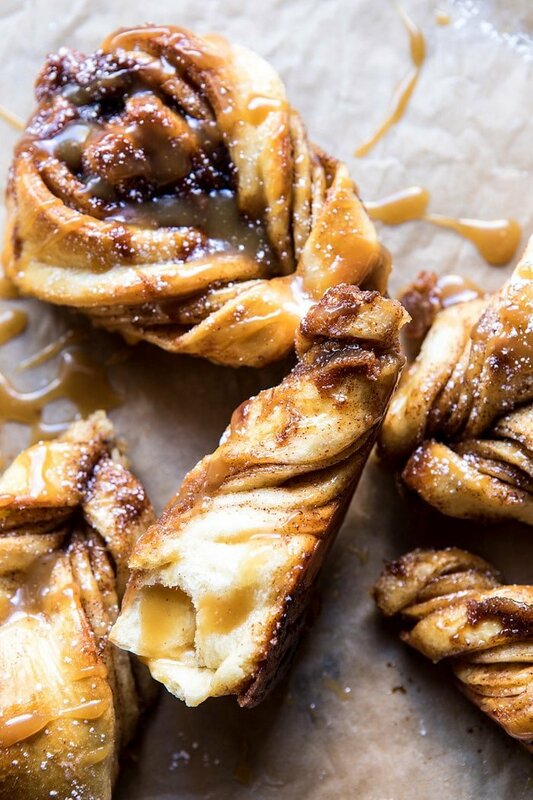 Think of this snowflake monkey bread like your favorite gooey sticky bun, but instead of in bun form, they’re in cute, pull-apart snowflake form. If like me you plan to make this for Christmas morning, you can form the snowflake on Christmas Eve, pop it in the fridge and let it sit overnight. In the morning, remove the snowflake from the fridge and let it sit at room temperature while the oven preheats, then just bake and eat! Since I wanted my bread to be extra, extra gooey, like my mom’s monkey bread that we traditionally eat on Christmas morning, I ended up making an extra butterscotch sauce to lightly drizzle over the snowflake. In full disclosure, the butterscotch sauce is totally not needed. The bread is sweet enough on its own, but it’s the holiday’s and let’s be real, while the bread is good enough on its own, it’s better with that additional butterscotch sauce. And a dusting of confectioners sugar…you know, for the snow effect. 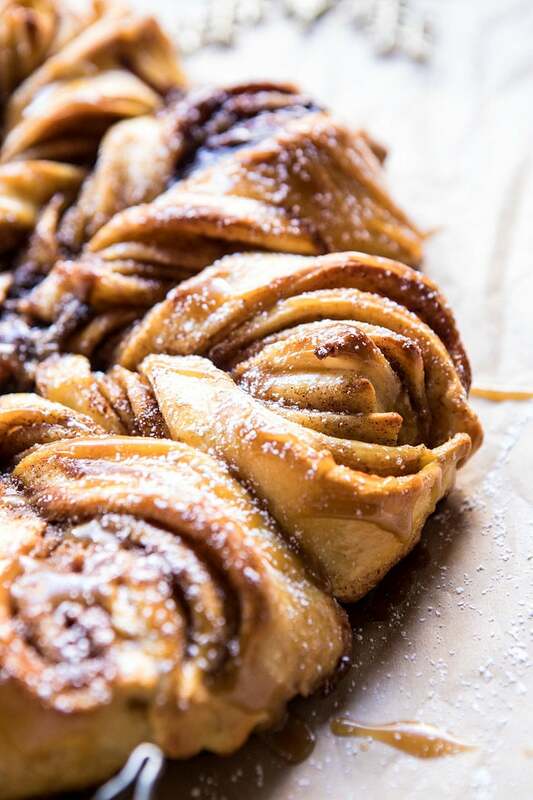 Warm, doughy, gooey, extra sweet, and loaded with cinnamon and butterscotch. It's basically the ultimate Christmas morning breakfast. 1. To make the dough. Combine the milk, yeast, honey, eggs, butter, 3 1/2 cups flour, and salt in a large mixing bowl. Mix on medium speed until the dough comes together and pulls away from the side of the bowl. The dough should be sticky, but if it seems too sticky, add the remaining 1/2 cup flour. 2. Remove the dough from the bowl and place on a lightly floured surface. Kneed into a smooth ball. Grease a large bowl and add the dough to the bowl. Cover the bowl with plastic wrap and let sit 45 minutes-1 hour or until the dough has doubled in size. 3. Meanwhile, make the filling. Mix the butter, brown sugar, and cinnamon to a bowl. 4. Lightly dust a surface with flour. Once the dough has doubled in size, punch the dough down and roll into a ball. 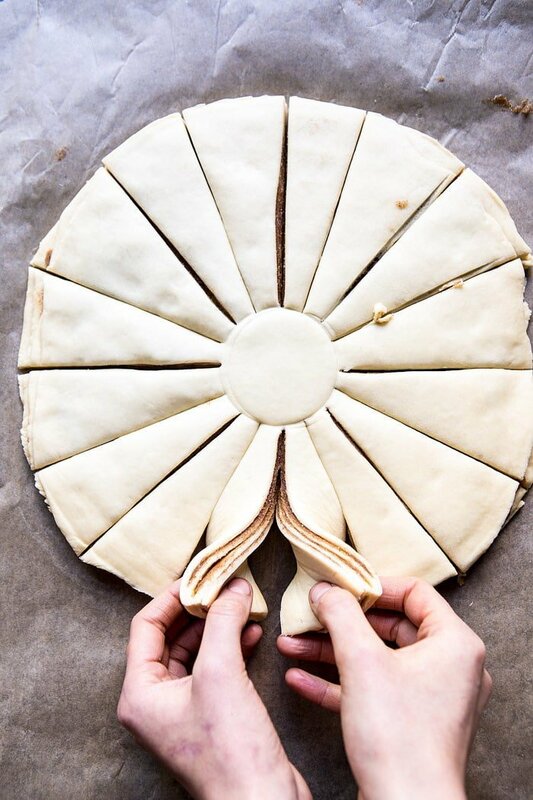 Cut the dough evenly into 4 pieces and roll each piece out into a 10 inch circle. Place 1 circle on a parchment lined baking sheet with sides. Spread 1/3 of the filling over the dough, leaving a 1/2 inch border around the edge. Place another piece of dough on top and spread with 1/3 of the filling. Add the 3rd layer of dough and spread with the remaining filling. Finish with the 4th dough round. 5. 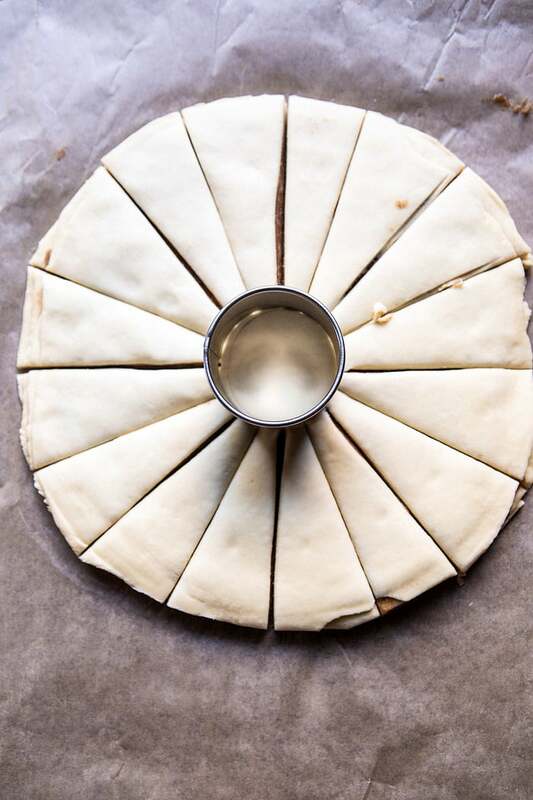 Place a 2 inch wide drink glass in the center of the dough and use as a guide when cutting the strips. 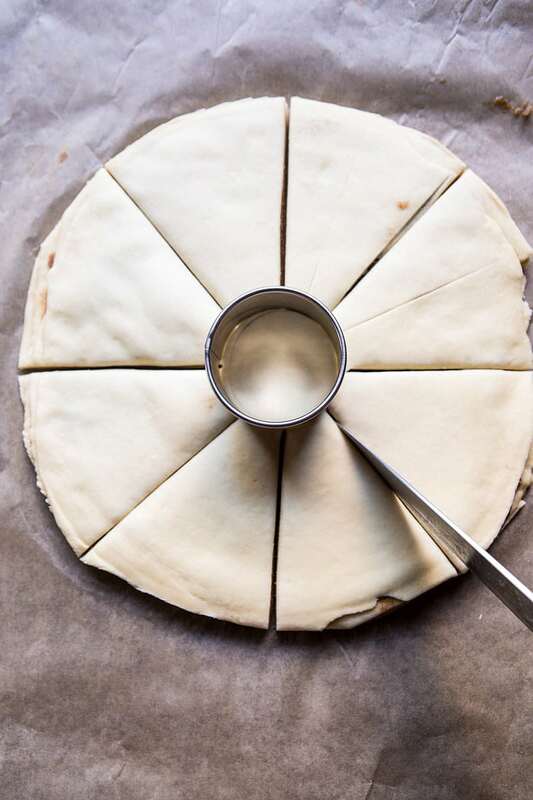 Using a sharp knife, cut the dough into 4 triangles, then cut each triangle in half creating 8 triangles. Now cut each triangle in half again to make a total of 16 triangles (see photos above for a guide). 6. Remove the drink glass. Lift the edges of 2 wedges that are next to each other and twist them away from each other twice. Pinch the ends to seal (see photos above for guide). Repeat with the remaining pairs of wedges. Cover the dough with plastic wrap and let rise in a warm place until doubled in size, about 45 minutes, or let rise overnight in the fridge. 7. Preheat the oven to 350 degrees F and position a rack in the center. Brush the snowflake with the beaten egg. Bake for 15 minutes, remove from the oven and carefully spoon any sauce that has leaked out of bread back over the bread. Return to the oven and bake another 15 minutes or until golden brown. 8. Meanwhile, in a small saucepan, combine the butter, brown sugar, and heavy cream. Bring to a boil and boil 3-4 minutes. Remove from the heat and stir in the whiskey and vanilla. 8. Drizzle the snowflake with butterscotch sauce and dust lightly with confectioners sugar. Eat warm. Enjoy! The best piece…the one with with extra butterscotch sauce…because it’s Christmas! PS. have you guys entered my Kitchen Aid Stand Mixer giveaway over on Instagram yet? This recipe looks and sounds amazing! I really want to make it, but can you please tell me how you manage to make all circles equal size like that? Whenever I roll out dough it always turns into an oval, square or misshapen circle, so I can’t even imagine making all 3 the same? You’re right, it’s not hard at all! I’ve made it myself 3 years ago, when I was even less experienced in cooking and baking than now. I know it under the name Beautiful bread – for a good reason. This is a crowd pleaser because A) it looks fancy and spectacular; B) it’s delicious! 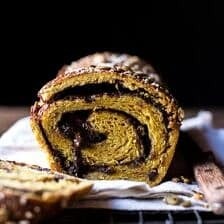 I’ve made a chocolate one, more ‘babka’ style, but every member of our family loved it! And what can I say, they are a picky eaters as yours as well. You can always count on yeast dough and a chocolate filling in our house. Thank you for reminding me this almost forgotten recipe, I need to take into consideration to make it again. But I have so many others in mind, I cannot decide what to bake first! Too many goodies and so little time.. It is super easy and just looks so nice right?! I love it! I am glad I could remind you of this and hope you enjoy yours at your holiday! It looks super nice on your site! Thank you! Oh my, what a unique looking bread. I have never seen this done before. Like someone else mentioned I can never get my pizzas or pie crust in a complete circle. How did you do it? This is not only beautiful but looks delicious. Oh yes, I would want to add the sauce to make it more gooey. 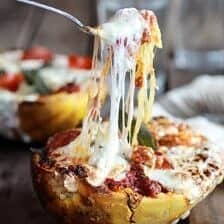 If I wasn’t doing low carb right now I would have to try this. Speaking of snow…. We live in North GA and got 7-12 inches this past Fri. and Sat. We have not had this much snow in years. It shocked everyone I think. It was one of the prettiest snows I can remember but ready for it all to be gone.HA!! Thank you so much Charlotte! I am so glad you like this & hope you get to try it soon! Tieghan, this bread is so pretty!! My first thought is that these snowflakes need to be shared! I love doing homemade Christmas gifts – do you think it would be feasible to make up the bread ahead of time, and gift it along with baking instructions and a jar of that (absolutely fabulous-sounding!) butterscotch sauce? Maybe if I made up the snowflakes and then froze them to keep the dough from rising out of control? I work at a school, so I’m thinking these would be the perfect thing for my coworkers to wake up to on the first day of Christmas Break! Well my goodness, that is showstopping-ly beautiful! Gorgeous. Do I need to make any adjustments for low altitude, since you are baking at high altitude? They look delicious, but they also look ummmm, like a lovely circle of a certain, specific anatomy?!?? Hahahaha! Sorry, but I can’t be the only one who sees this??? I do think your brother’s gf Lyndsie would agree! Hi Ann! There are many things in nature that resemble the human anatomy. I am sorry if you found this offensive, that certainly was not the intent. Not offended at all! I think it’s hilariously beautiful! Laughter is life! We should all giggle more! Happy Holidays to you! I am glad! Happy Holidays! My thoughts *exactly* – I’m glad I’m not the only one! I saw it too! I came to read the comments to see if anyone else had the same thoughts. I have cognac on hand and not whiskey… Could it be substituted? Thanks! I don’t see why this couldn’t be made, shaped, and then frozen–to be taken out the day before, thawed and baked in the morning. Has anyone done this? 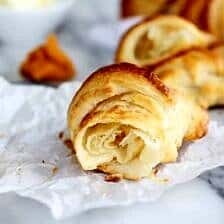 I have done it with many a puff pastry item and yeast rolls. Thoughts?? I am going to make this and possibly eat it by myself while I wait for my college children to wake up on Christmas morning. I think it would pair nicely with champagne as well. Merry Christmas to me! PS. LOVE the way you think with the champagne!! 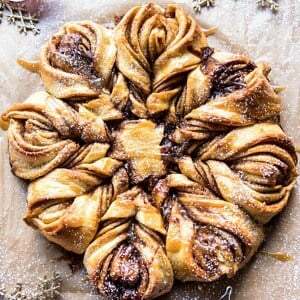 Can the pull apart snowflake be made with gluten free flour? What an adorable and festive bread Teighan. Adore the sauce and everything about it. It would make a perfect centerpiece for our Christmas table. Thank you so much Asha! I am so glad you like this! This looks absolutely amazing and and I wish I had it in front of me right now haha! So delicious!! This looks amazing! I am planning on bringing it in for an office holiday party, but I won’t be able to warm it up. If I top it with the sauce the morning of, then sprinkle with sugar right before, think it will be as splendid? Oh, Tieghan! You have found the magic ingredients! I have made this star shaped bread with a cinnamon /sugar filling. It’s beautiful, but it needed “something” to make it taste as fabulous as it looks! Butterscotch will be ahhhh-mazing! It really is rather easy to make, too! It doesn’t matter if each circle,is not exactly the same…the rising evens things out. I’m very anxious to try your recipe! Thank you! Thank you so much! I am really glad you like this and hope it turns out amazing for you! I tried this with a pesto, toasted pine nuts, and Parmesan filling tonight. Oh my….!! Tho, if you try this…use a rimmed sheet! Some pesto dripped off the parchment and I made a mess of my oven! We had some marinara sauce for dipping…hubby declared it a Keeper! I am so happy you and your husband loved this! Thank you!! I’ve got to try one of these Tieghan! It’s just beautiful and sounds delicious! Yes! I hope it turns out amazing for you Mary Ann! Thank you! I’m sorry you aren’t getting blankets of snow. The weather does seem to be changing and is a bit off. Hopefully it will snow over the next few weeks! Maybe you can make some smores and have a nice night outside. Also, have you heard about the geminid meteor shower this week? I recommend seeing them this year! Hi Kristin! I am so so glad you like this! And no I have not heard about that, but I totally want to check it out! Thanks for letting me know! I hope you are staying warm as well! I can imagine this will go down a treat around the lunch table on Christmas! Wow. I’d think you’d have, at the very least, given credit to King Arthur Flour. Just because you change the name of a recipe and pour butterscotch sauce over it doesn’t make it original. Hey Karen, I don’t even know what King Arthur Flour recipe you are referring too, I have never scene it. If you google snowflake bread many, many, MANY variations will come up. If I had adapted it from someone, I would have stated that information. As I mentioned within the post, this is my moms monkey bread recipe, but in a different form. If you don’t like what you see here, please feel free to just kindly click away. Negativity is not welcome. Thank you and Happy Holiday’s to you and your family. So pretty, I love that you made this as monkey bread! We just made this and it was a huge success! 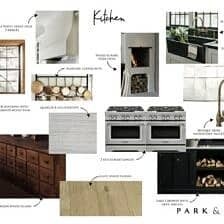 Normally when I bake in the kitchen it’s a DISASTER involving fire alarms, burnt crusts, and a terrified barking dog…I’m not so good with the oven. But with this I just followed the instructions, refrigerated overnight and baked for breakfast and it tastes and looks amazing! I would say the butterscotch sauce is NOT optional, though. We added extra whiskey and didn’t look back. ☺️ Also enjoyed mimosas for breakfast (we used the bottle as an impromptu rolling pin) so we’re on a welcomed sugar rush right now! I am really glad this recipe did not involve any fire alarms or burnt crusts haha! Also, really glad you enjoyed this and enjoyed making it, sounds like such a fun morning! Thank you Rebekah! WAAY too much filling! I’m going to cut the filling recipe in half next time. For now, I have a delicious mess. Hi Bob! Sorry about that. I hope this still turns out great for you and even better next time! Thanks! If I don’t have any liquor for the butterscotch sauce, but still want to make it, could i just use vanilla or leave it out altogether? This is the prettiest thing I’ve ever seen!! Totally gonna make this for my family this Christmas. Can’t wait!! Thank you so much for sharing. Thank you! I hope this turns out amazing for you! Thanks! Thank you for the pictures of the “pinching” process. I just made King Arthur Flour’s Savory Star Bread with a pesto filling and I had trouble with that pinching process. It looks okay and I’m sure it will taste delicious. But now I have a better visual in mind for my next one which WILL be this sweet snowflake pull-apart. My husband loves butterscotch and I’ll make sure he gets that piece with the extra butterscotch sauce…after all it is Christmas.. I hope you love this recipes Carmen! Let me know how it turns out for you! Merry Christmas! 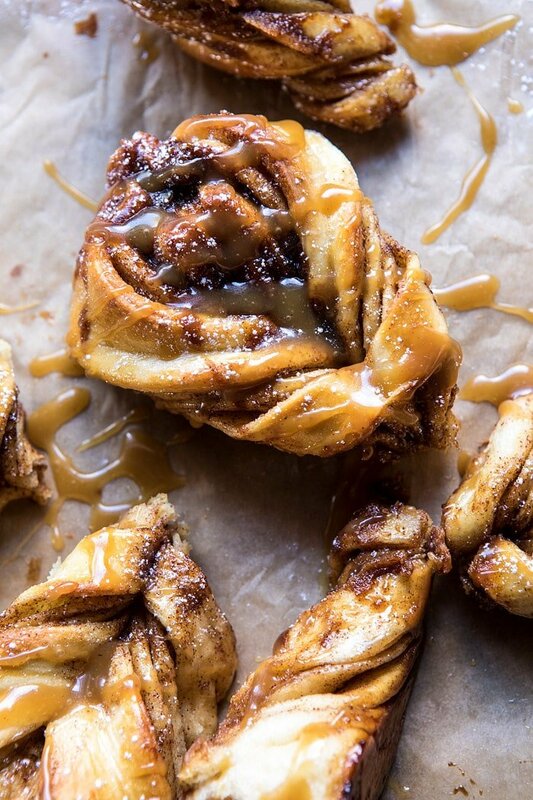 If I wanted to cheat and use a store bought pre-made dough (ie. Pillsbury) which kind would you suggest, this seems to be a bread type dough? I love the snowflake bread, I have made the raspberry one it turned out great. But I wanted to give this one a try also. 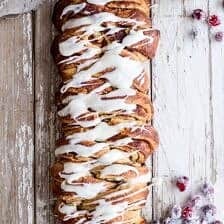 I want to freeze it and give a a gift, Do I need to change the recipe at all to freeze the bread? 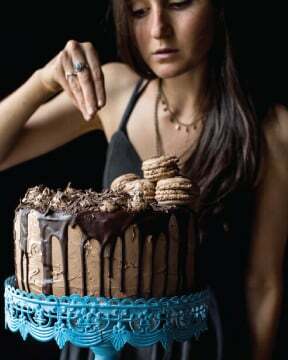 Hello, I am making this tonight and letting it rise in the fridge. Do I need to pull it out and let it sit on the counter before putting in the oven or can I put in the oven right away? Thanks so much! So is that 3 eggs in total ? The 3rd egg is used for the wash, see step 7. 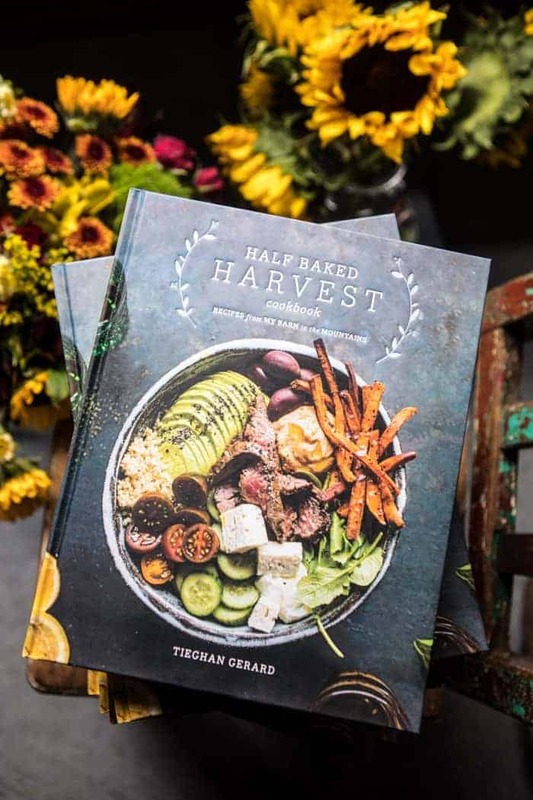 This recipe looks amazing and beautiful! I made it today and will bake for Christmas tomorrow. Thank you for the pictures- totally helped! I hope this turned out amazing for you, Bridget! Thank you! I made this and it turned out perfect. I was really worried because it looks so complicated, but it was beautiful. I am totally a Half Baked Harvest baker now. You are so talented Tieghan! Thank you for sharing your recipes! I will be making this every year for Christmas. Just wanted to add- the sauce is soooo good. And I did not have ‘too much’ filling at all. This looks beautiful and delicious. You make it look so easy. Thank you Dwight! I am glad you like this! Tieghan – I was sick & didn’t make this on Christmas morning so I made it New Years Day morning. It is absolutely delicious – tho not as pretty as yours. Ha. Nibbling on it while watching The Tournament or Roses Parade.it was actually not that difficult to make – the pictures & video really helped. Made it last night & let it rise overnight in the fridge. Very yummy & beautiful to look at – guests impressed. Hi Cindy! I am so happy you made this and enjoyed it! Thank you! I hope your New Year is off to a great start! 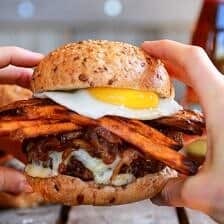 I just want to say I love your blog and me, being a young baker, I get so much inspiration from your blog and I love the uniqueness of your recipes. This recipe stood out to me as something I just HAD to try!! 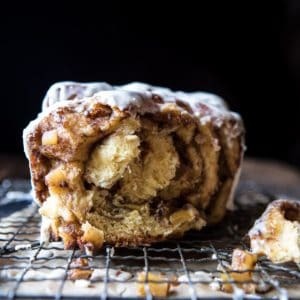 So I prepared it on Christmas eve including making the butterscotch sauce that day too, and on Christmas morning, I was able to put in the oven, no big deal, and then enjoy the tastiest monkey bread ever!!! It is a keeper! I have also tried your pierogie recipe and your chocolate cupcake recipe and have made them at least 3 times! Thank you! Hi! I am so glad you enjoy the recipes on my blog! Thank you so much Alea! I made this today with three grated apples (lightly squeezed to remove excess moisture) added to the filing. It was too die for!!!! Even without the butterscotch sauce. Very easy to follow recipe. 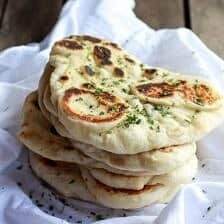 The bread is so nice and soft, I have printed this recipe of and added to my favourite recipe cook book. I am so glad you enjoyed this Cait! Thank you! I bookmarked this when you first sent it out but didn’t make it because we had soooooooo many other sweet and rich foods already lined up for the Christmas season. However, in the back of my head, I thought I’d save it for our Easter morning breakfast. I assembled it all yesterday, put it in the fridge overnight and baked it up this morning. It was a HUGE hit! For the record, it is NOT way too much filling. And the butterscotch sauce addition was a welcome addition. Not too much of that either! I’m looking forward to making it again in this same form as well as making a savory version like several of your commenters mentioned. Thank you for stressing how easy and fun this bread really is for the average home baker to make! I am so glad you enjoyed this Sarah! Thank you so much! Looks so yummy! Is there any way to make this ahead of time? Or at least compete part of the recipe ahead of time? I made this today for my daughter’s nameday (her name is Esther which means ‘star’ so I chose to see the bread as a star ;)). It was indeed easy to follow recipe and delicious! Loved the butterscotch sauce, though I made just half quantity. That is so sweet! I am so glad you enjoyed this recipe, Vera! Thank you! This was incredibly easy to make! Mine is currently rising in the fridge as a test run for a hostess gift this holiday. Can’t wait to see how it turns out. Thanks Tieghan! Store bought dough. If so what kind. Do you have to have a standing mixer for this or will a handheld mixer work? Well, I did it! My proudest baking moment to date (and I’m 47 and do a lot of baking)! Wasn’t as hard as it looks. I never have good luck with homemade bread products. I can’t even make biscuits but hubby loves monkey bread and I was determined to not give up and just dive into it. Very glad I did. I didn’t have perfect circles either to some of you mentioning ovals. Mine were more ovally and they still turned out fine. I told myself no matter what it looked like, as long as it tasted good, I’d still try it. I only have a hand mixer and that was the biggest challenge. Finally, after the beaters wouldn’t stop bogging down and slinging dough out, I just took it out of the bowl and started kneading it to get the “ball” stage I needed. I was worried that it wouldn’t turn out proper since I couldn’t mix it properly but it was fine. Thanks for sharing this recipe! Husband said it will be his birthday dessert from now on! I am so glad this turned out amazing for you Lisa! Thank you so much for making this! Happy Holidays! I know I am a little late to the party here, but I made this twice during the holidays and it is amazing. It was easy to make with beautiful results. My daughters and husband helped and they took pictures along the way. I made a cream cheese drizzle and we ate it all! So amazing. Thank you for the pictures, they really helped! Thank you so much Allana! I am so glad you and your family loved this monkey bread!